There's a long list of lawmakers who have faced criminal charges and vowed to press on with re-election. It often doesn't end well. "You're innocent until proven guilty," James Gardner, a professor of election and constitutional law at the University at Buffalo School of Law, told NBC News. "Doesn't matter if you're under an enormous cloud of suspicion or whether you've deceived shareholders and the American public to personally profit." There is no federal or state law that bars someone from appearing on a ballot because they have been indicted on criminal charges. Candidates in most states can even seek election if they are convicted, creating little incentive to quit, especially if the seat is, like Collins', considered a sure bet for re-election. "You expect people to do the right thing, to resign. In many cases it could, and should, be that simple," said Gardner. "Politics isn’t simple." History contains plenty of examples where things didn't go well. The former Ohio Democratic congressman was indicted in 2001 on bribery, conspiracy and tax evasion charges. Traficant vowed to not resign and to fight the charges, even representing himself during his trial. After he was convicted on 10 felony counts in April 2002, Traficant still would not resign. He filed the next month to run for re-election as an independent in his Youngstown-area district. Months later, the House Ethics Committee recommend his expulsion from Congress, and the House voted to expel him. Traficant was sentenced to seven years in prison, but maintained his candidacy as an independent, and got 15 percent of the vote. In July 2015, Fattah, then a Democratic congressman from Pennsylvania, was indicted on federal racketeering charges. While recusing himself from his leadership post on the House Appropriations Committee, Fattah vowed to not resign his congressional seat and ran for re-election. He lost the Democratic primary for his seat in April 2016 but still didn't quit, and held on all the way through his trial in June 2016. Only after being found guilty on all charges, did he finally resign from Congress. He was sentenced to 10 years in prison. 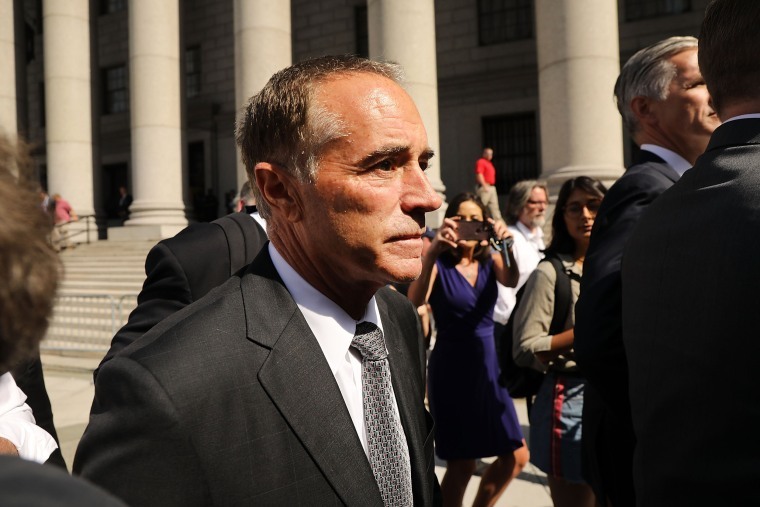 In April 2014, the New York Republican congressman was indicted on fraud charges, pleaded not guilty, vowed to fight the charges and ran for re-election. Grimm won, but weeks later pleaded guilty to tax evasion. He then refused to accept the seat that he'd won, resigning from Congress in January 2015. He was sentenced to eight months in prison, and then ran for his old seat earlier this year, but lost in the GOP primary. Louisiana Democratic Rep. William Jefferson was indicted on federal bribery charges in 2007, ran for re-election, got through the primary and then lost the general election, before being found guilty on several charges in 2009. Alaska Republican Sen. Ted Stevens was indicted on, and found guilty of, felony corruption charges in 2008, but he refused to resign and lost his re-election bid, although his conviction was later voided. Illinois Democratic Rep. Dan Rostenkowski was indicted in 1994 on corruption charges, ran for re-election, and lost. And then there's New Jersey Democratic Sen. Bob Menendez, whose story is the kind that Collins was almost certainly praying for. Menendez was indicted in 2015 on federal corruption charges and went on trial in 2017, vowing throughout not to resign his seat. He wouldn't even say publicly whether he would leave if convicted. Menendez never had to make that decision. In January, his trial ended in a mistrial after jurors couldn't reach a unanimous verdict. In March, with the charges behind him for good, he formally announced his re-election campaign. Despite all the drama, his prospects of victory are strong: He leads his Republican challenger in polls by an average of nine points.